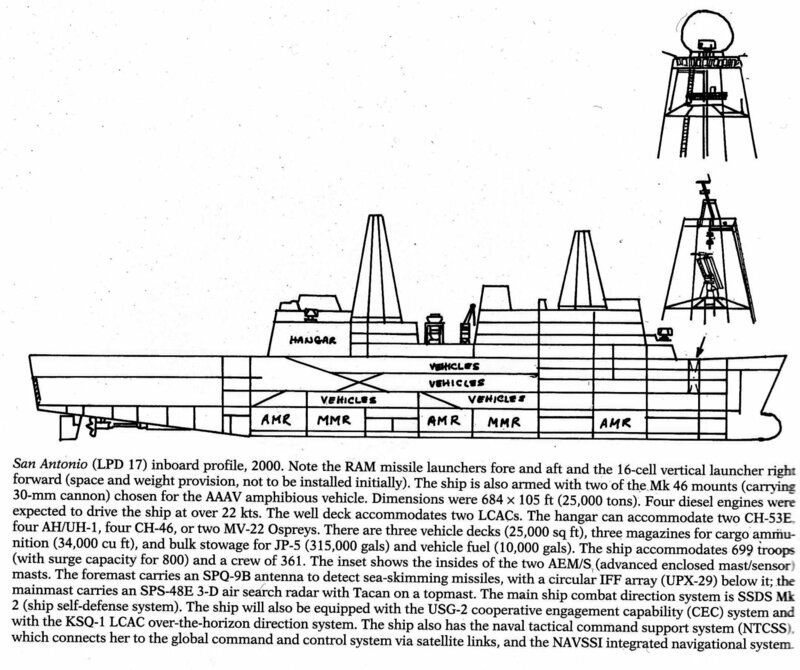 Laid down, 9 December 2000, at Northrop Grumman Ship Systems, Avondale Operations, New Orleans, LA. 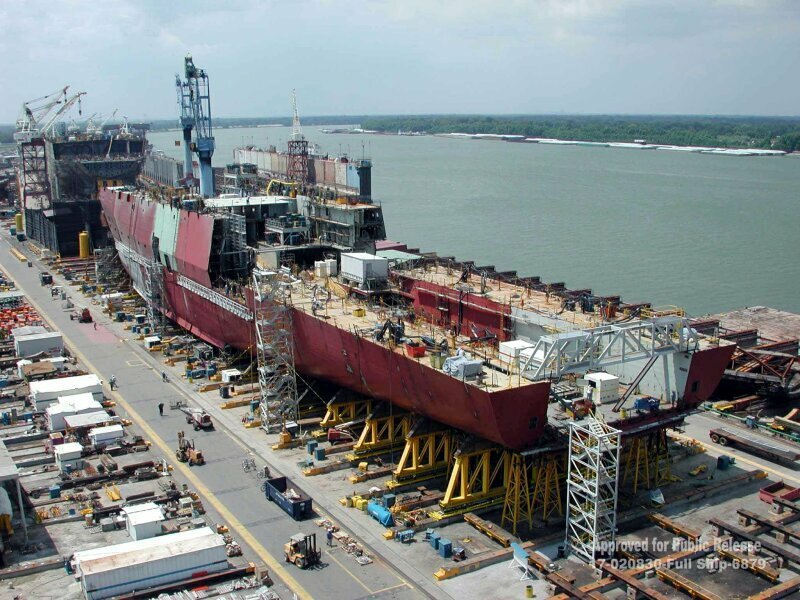 The Landing Platform Dock 17, San Antonio Class, is the latest class of amphibious force ship being built for the United States Navy. 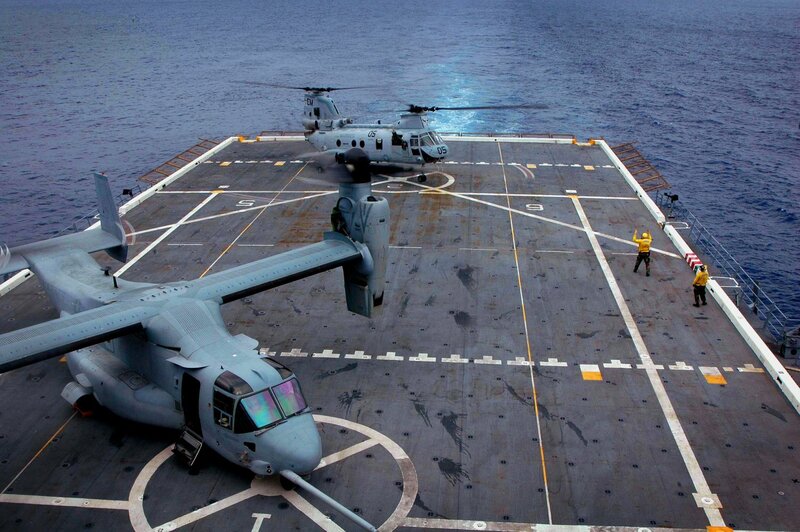 The mission of the San Antonio Class is to transport the US Marine Corps "mobility triad", that is, Advanced Amphibious Assault Vehicles (AAAVs), air-cushioned landing craft (LCAC), and the MV-22 Osprey tiltrotor aircraft, to trouble spots around the world. 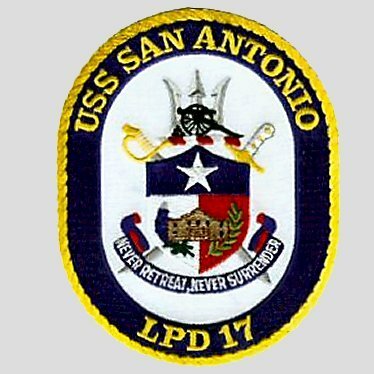 Commissioned USS San Antonio (LPD-17) January 14, 2006at Naval Station Ingleside, TX. 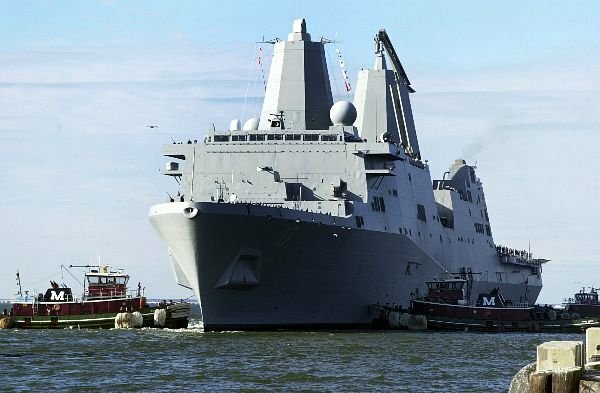 USS San Antonio is homeported at Norfolk, VA.
364k Inboard profile (2000) of San Antonio (LPD-17) Class Amphibious Transport Dock. 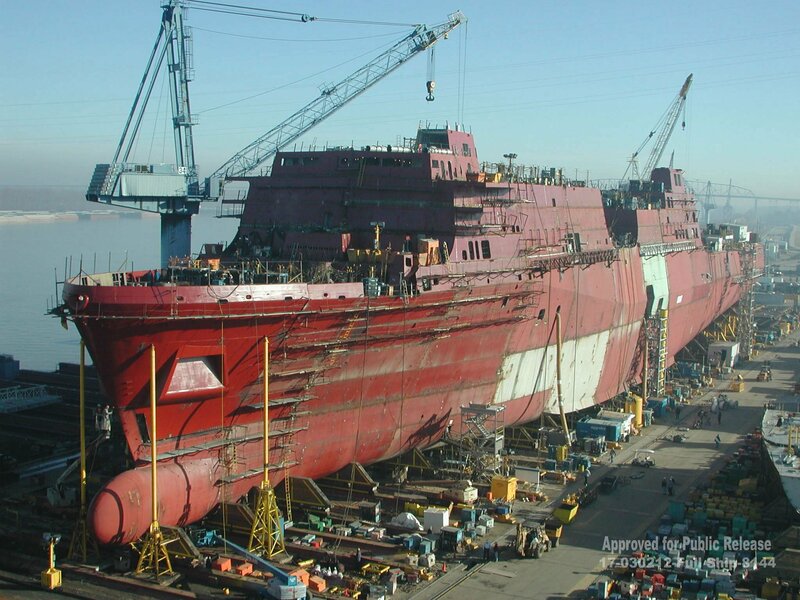 132k San Antonio (LPD-17) under construction on her building ways at Northrop Grumman Ship Systems, Avondale, LA. 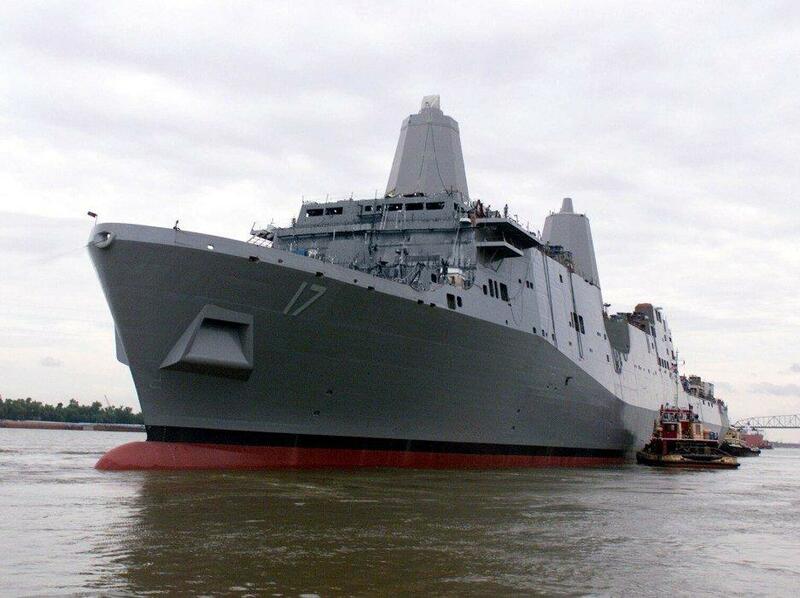 138k San Antonio (LPD-17) under construction on her building ways at Northrop Grumman Ship Systems, Avondale, LA. 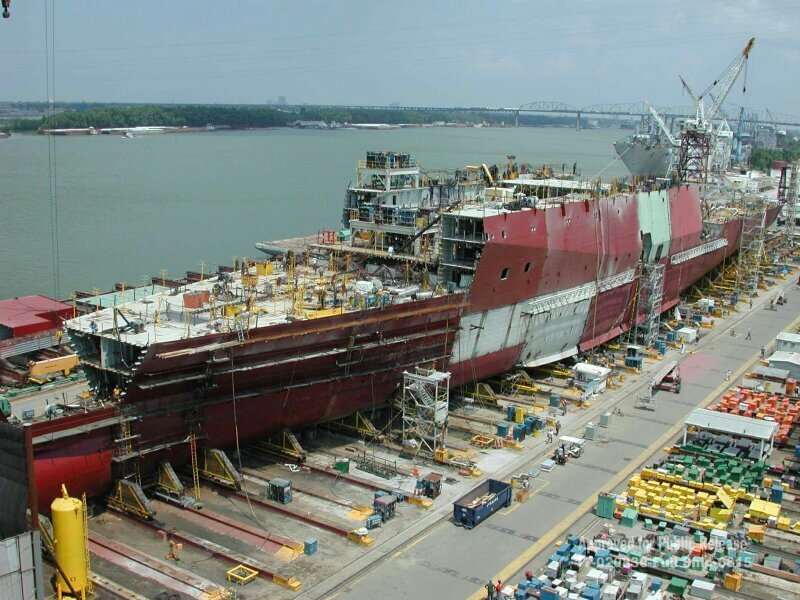 483k San Antonio (LPD-17) under construction on her building ways at Northrop Grumman Ship Systems, Avondale, LA. 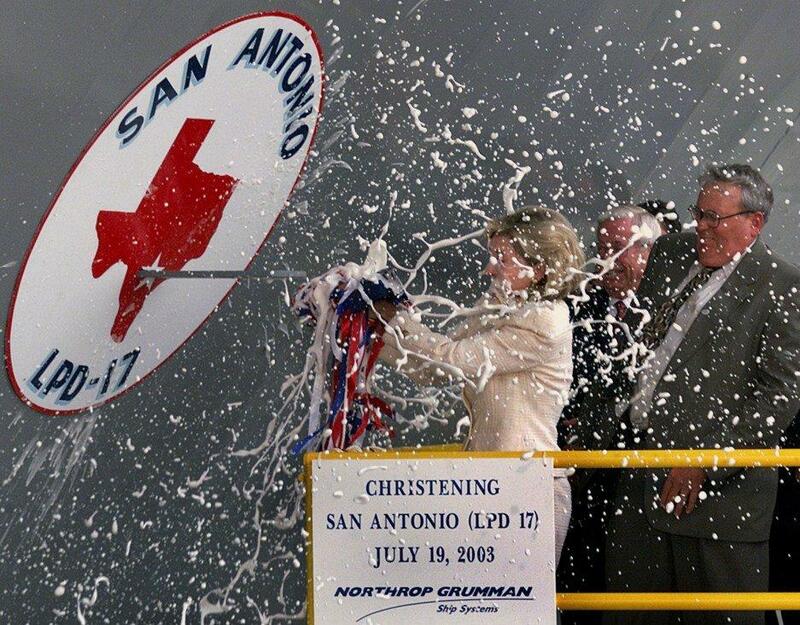 182k Ship sponsor, Texas Senator Kay Bailey Hutchison, christens San Antonio (LPD-17), 29 July 2003, at Northrop Grumman Ship Systems, Avondale, LA. 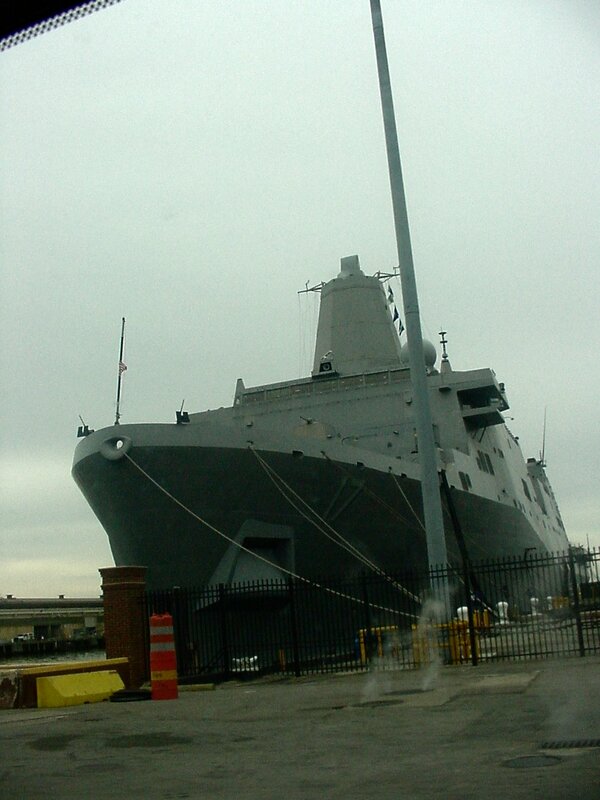 34k San Antonio (LPD-17) arrives at her new homeport, Naval Station Norfolk, VA., December 12 2005. San Antonio stayed at Norfolk for the 2005 holidays and then sailed to Ingleside, TX. for her commissioning ceremony, January 14, 2006. 48k San Antonio (LPD-17) sailors man the rail as the ship arrives at her new homeport, Naval Station Norfolk, VA., December 12 2005. 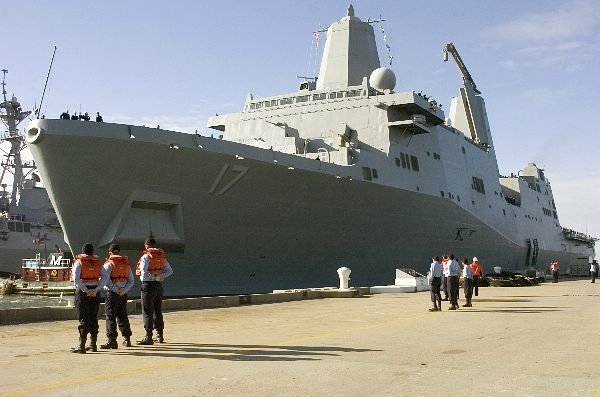 47k San Antonio (LPD-17) arrives at her new homeport, Naval Station Norfolk, VA., December 12 2005, as line handlers stand by to secure the ship to the pier. 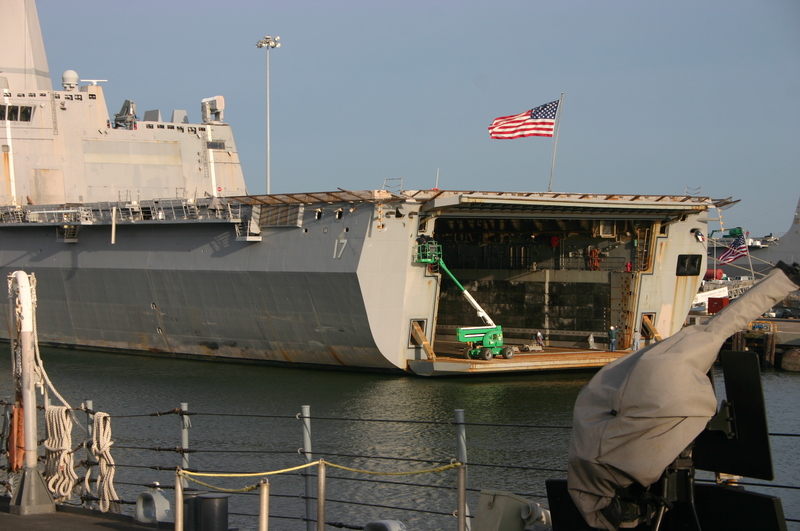 46k Sailors assigned to USS San Antonio (LPD 17) man the ship, 14 January 2006, officially bringing her to life, during her commissioning ceremony held on board Naval Station Ingleside. 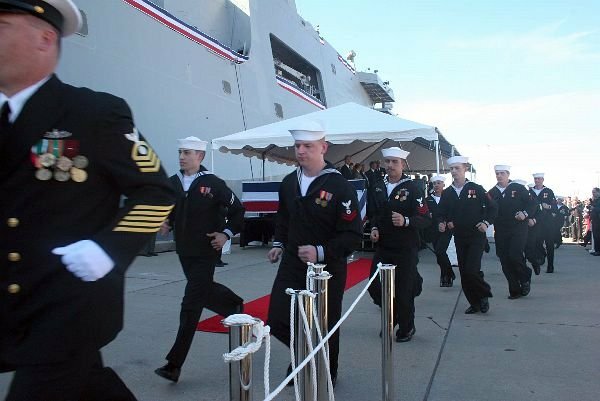 Under Navy tradition, Sailors charge aboard the ship, and man the rails signifying ownership. 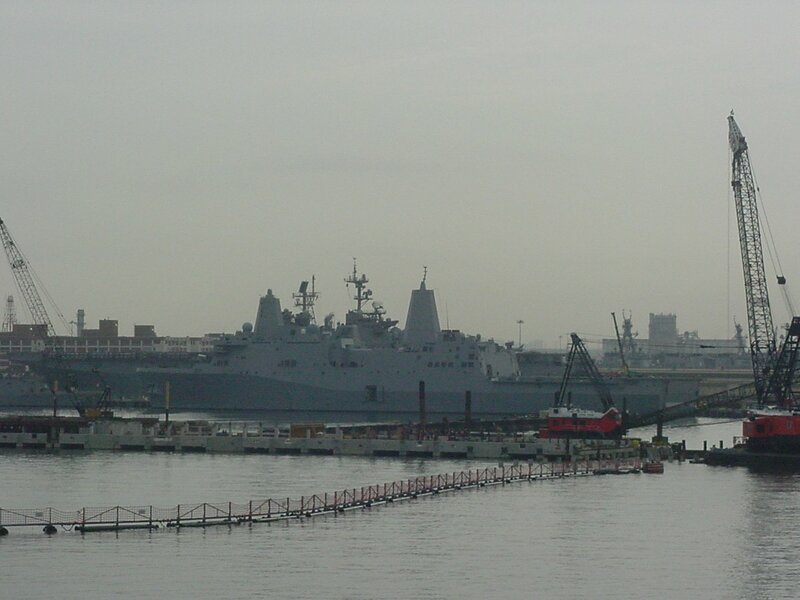 48k Sailors assigned to USS San Antonio (LPD 17) man the ship, officially bringing her to life, during her commissioning ceremony held on board Naval Station Ingleside, 14 January 2006. 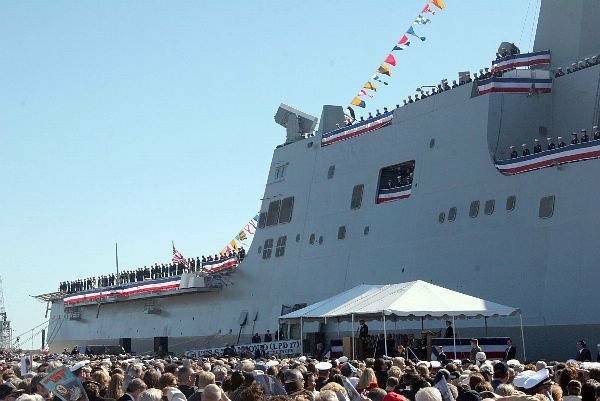 48k Sailors assigned to USS San Antonio (LPD 17) enjoy a rare honor, and receive the oath of enlistment by the 41st President of the United States, the Honorable George H.W. 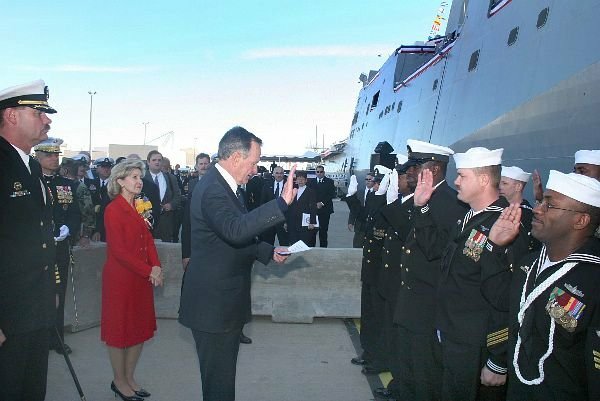 Bush, following the ship’s commissioning ceremony held on board Naval Station Ingleside, 14 January 2006. 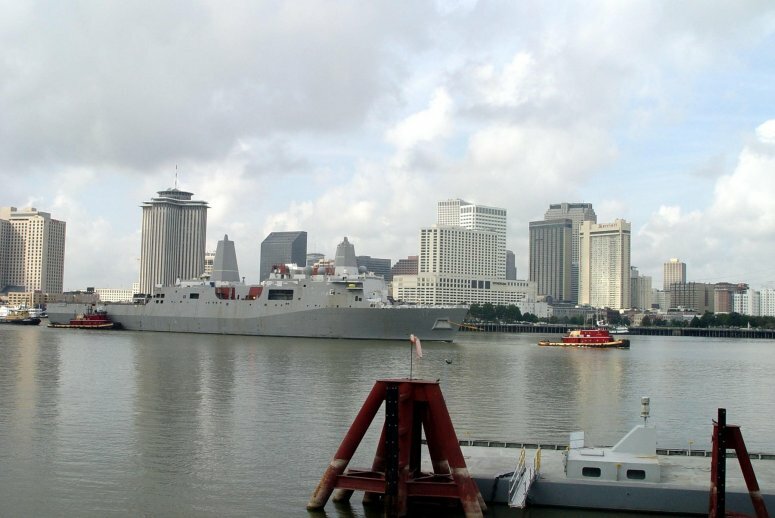 58k USS San Antonio (LPD 17) gets assistance from a tugboat as she prepares to moor at her new homeport of Naval Station Norfolk, VA., 25 January 2006 As the first in her class, San Antonio represents a key element of the Navy’s sea base transformation. 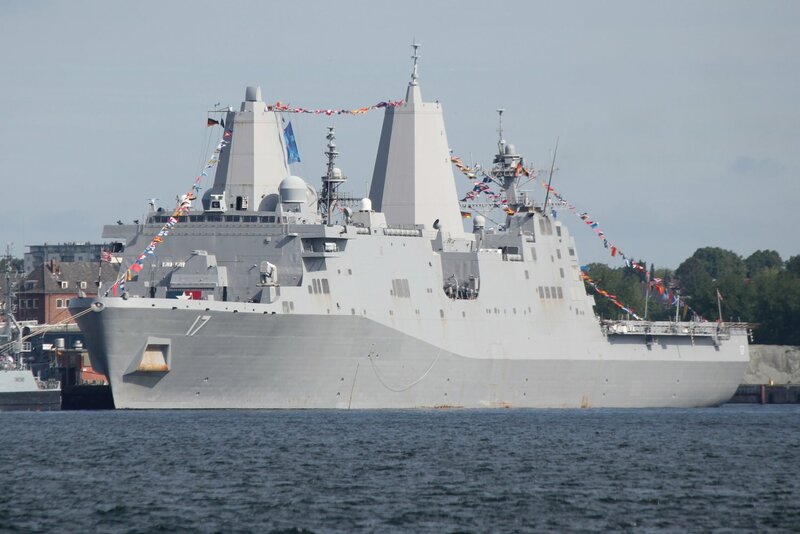 The San Antonio-class will functionally replace over 41 ships (LPD 4, LSD 36, LKA 113 and LST 1179 classes of amphibious ships) providing the Navy and Marine Corps with modern sea-based platforms. 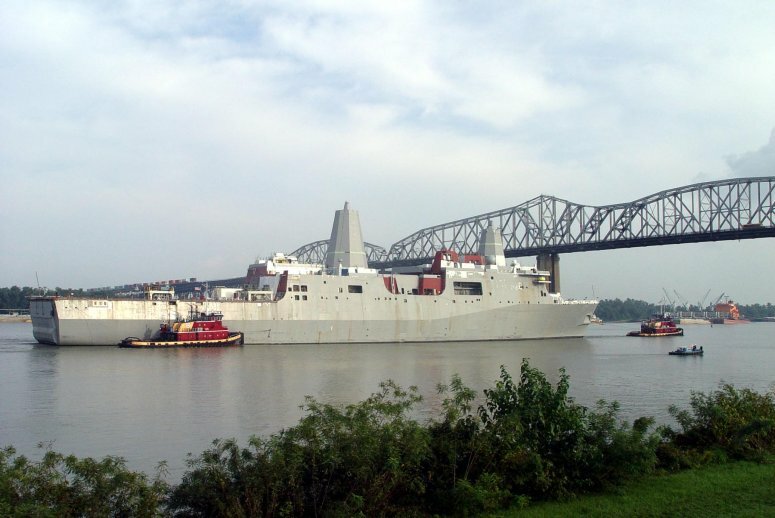 49k USS San Antonio (LPD-17) gets assistance from a tugboat as she prepares to moor at her new homeport of Naval Station Norfolk, VA, 25 January 2006. 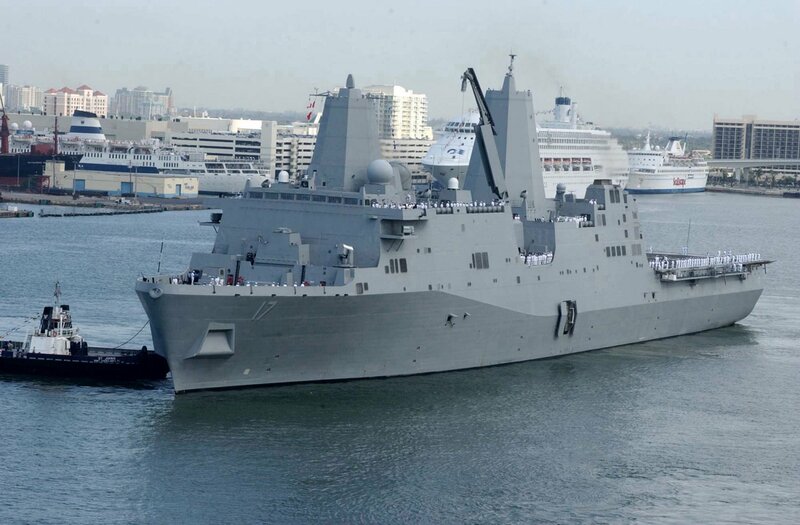 326k USS San Antonio (LPD-17) arrives at Port Everglades, FL., 1 May 2006, in support of South Florida's Fleet Week USA. 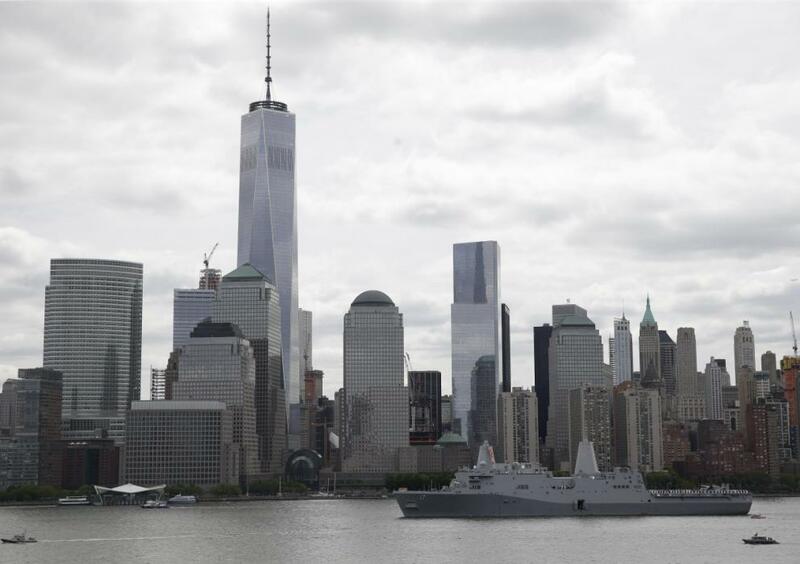 Nearly 3,000 Sailors are participating in this year's fleet week, which will include carrying out community service projects through Habitat for Humanity, visiting local schools and hospitals. 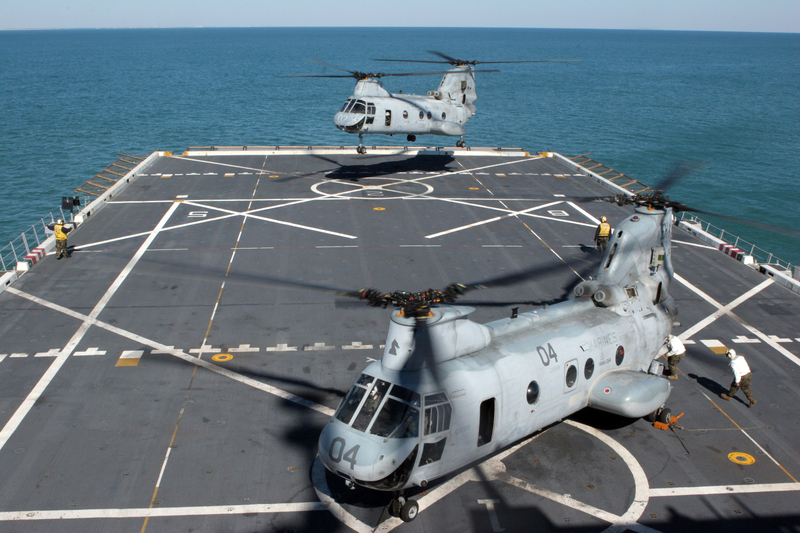 343k A CH-46 Sea Knight helicopter completes a landing near a MV-22 Osprey tiltrotor aircraft on the amphibious transport dock USS San Antonio (LPD-17), 5 June 2006. 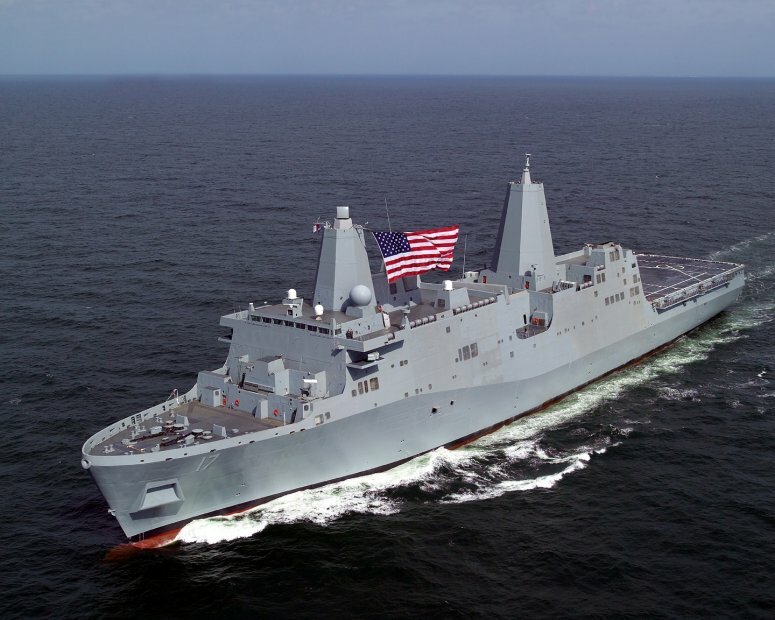 The ship is conducting several tests in the Atlantic Ocean using the Osprey and Sea Knight to determine what these aircraft are capable of doing with the Navy's newest class of amphibious transport dock ships. 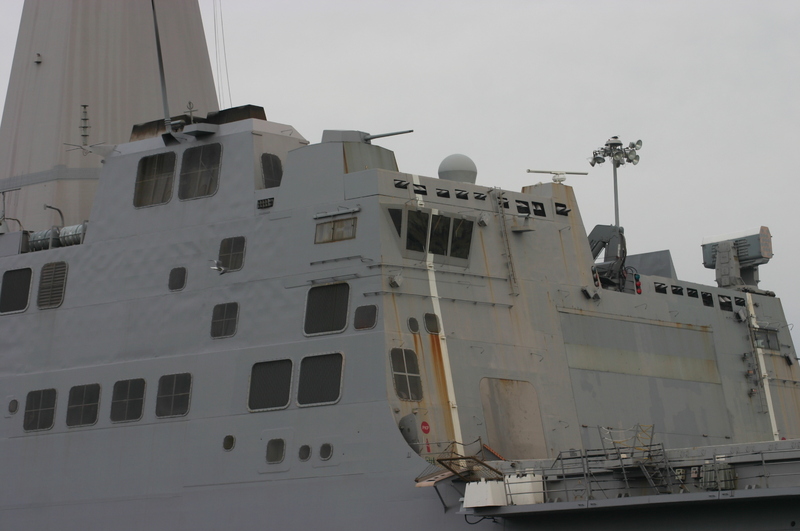 245k Port bow view of USS San Antonio (LPD-17) moored at Naval Station Norfolk, VA., the week of 7 December 2007 Photo by Wendell Royce McLaughlin Jr.
197k Port broadside view of USS San Antonio (LPD-17) moored at Naval Station Norfolk, VA., the week of 7 December 2007 Photo by Wendell Royce McLaughlin Jr.
4872k CH-46E Sea Knight helicopters, assigned to Marine Medium Helicopter Squadron (HMM) 264 (Reinforced), 26th Marine Expeditionary Unit, land on the flight deck of USS San Antonio (LPD-17), 9 March 2008. 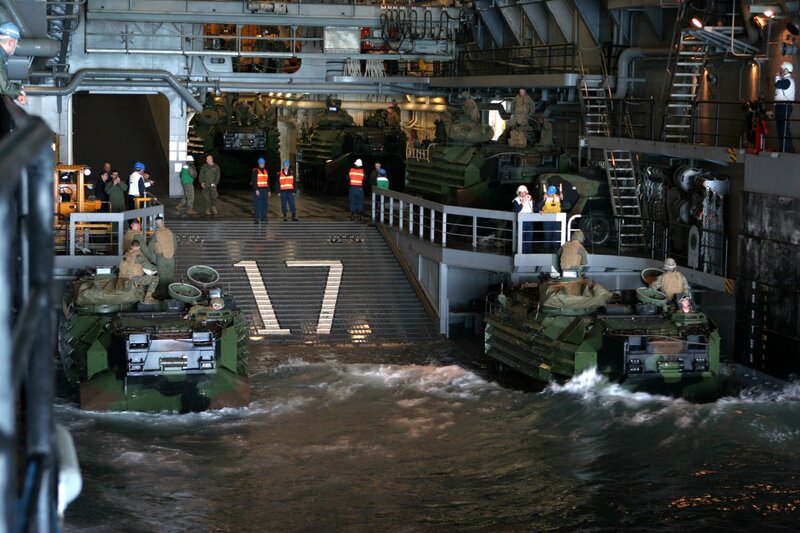 303k US Marine Corps amphibious assault vehicles wait to be guided onto the vehicle stowage area inside the well deck of USS San Antonio (LPD-17), 9 March 2008. 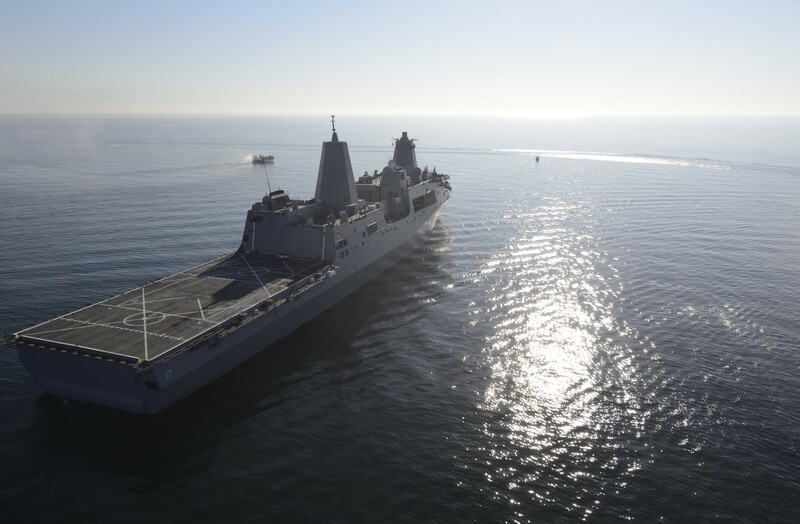 1486k USS San Antonio (LPD-17) conducts passenger transfer with the amphibious dock landing ship USS Carter Hall (LSD-50) during the Iwo Jima Expeditionary Strike Group (ESG) composite unit training exercise (COMPTUEX). COMPTUEX provides a realistic training environment to ensure the strike group is capable and ready for its upcoming scheduled deployment. 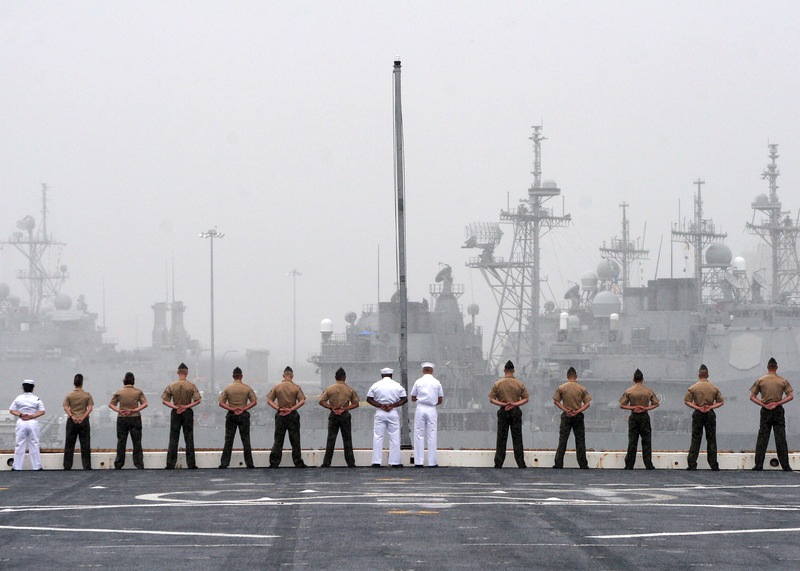 563k Sailors and Marines aboard USS San Antonio (LPD-17) man the rails for the ship's departure for her maiden deployment, 28 August 2008. San Antonio is part of the Iwo Jima Expeditionary Strike Group en route to the U.S. 5th and 6th Fleet areas of responsibility supporting maritime security operations. 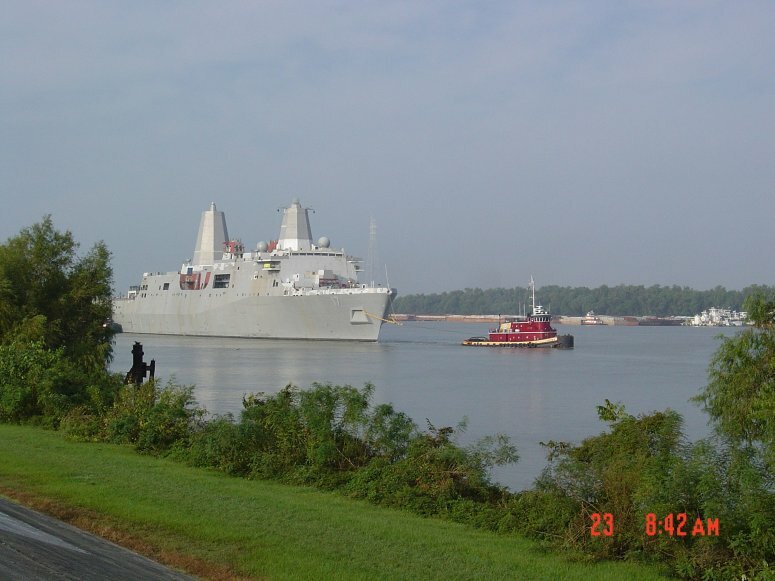 395k USS San Antonio (LPD-17) outbound to sea from Norfolk, VA., 28 August 2008 as part of the Iwo Jima Expeditionary Strike Group (IWO ESG) supporting maritime security operations and theater security cooperation efforts in the U.S. 5th and 6th Fleet areas of responsibility. 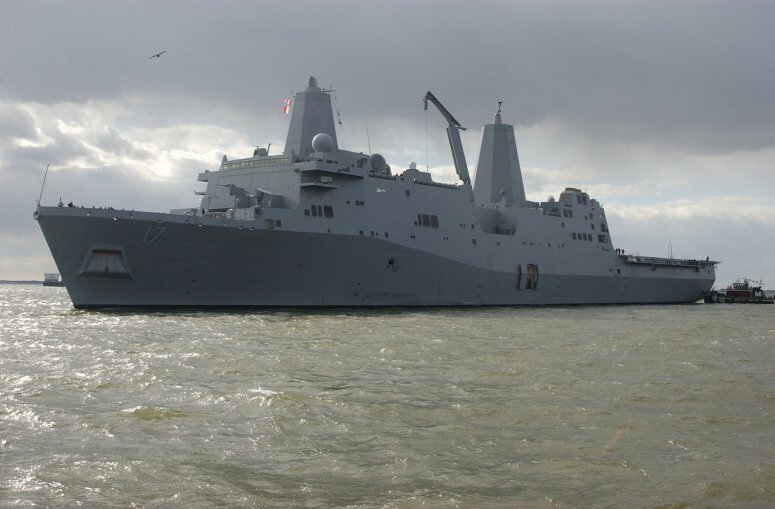 1874k USS San Antonio (LPD-17) transits the Atlantic Ocean, 3 September 2008. 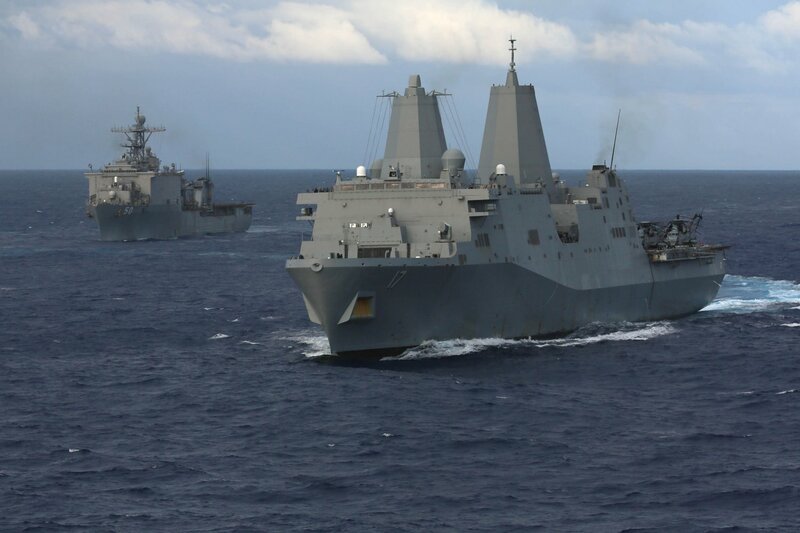 San Antonio is deployed as part of the Iwo Jima Expeditionary Strike Group, which is supporting maritime security operations in the U.S. Navy's 5th and 6th Fleet areas of responsibility. 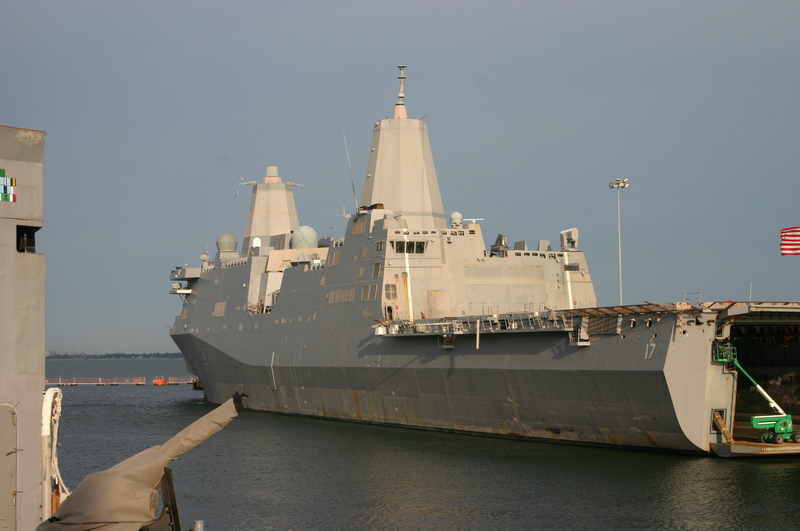 1925k USS San Antonio (LPD-17) steams though the Atlantic Ocean, 3 September 2008. 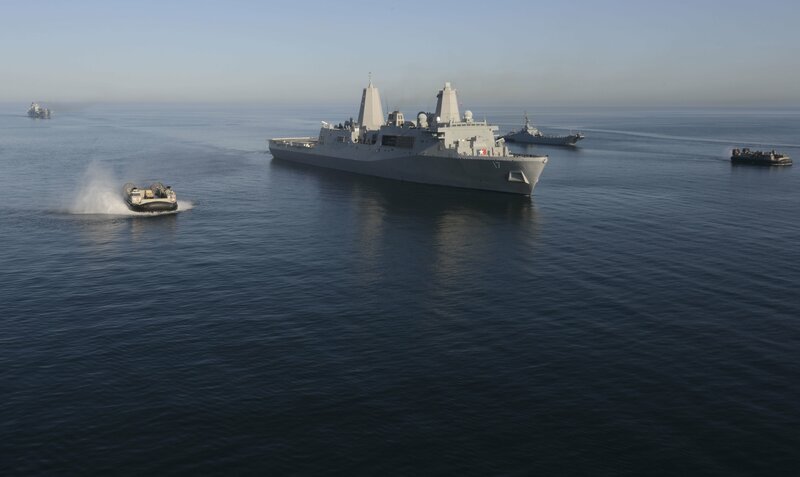 San Antonio is deployed as part of the Iwo Jima Expeditionary Strike Group, which is supporting maritime security operations in the U.S. Navy's 5th and 6th Fleet areas of responsibility. 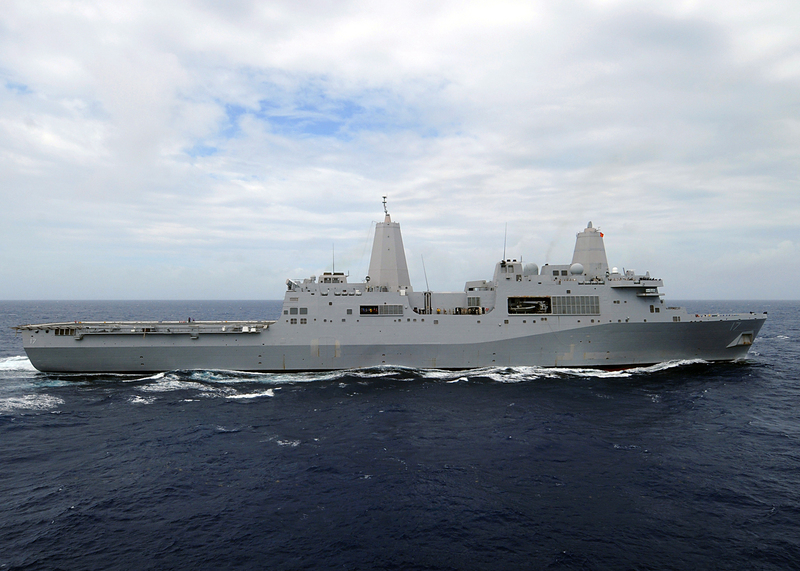 2319k USS San Antonio (LPD-17) transits the Atlantic Ocean, 6 September 2008. 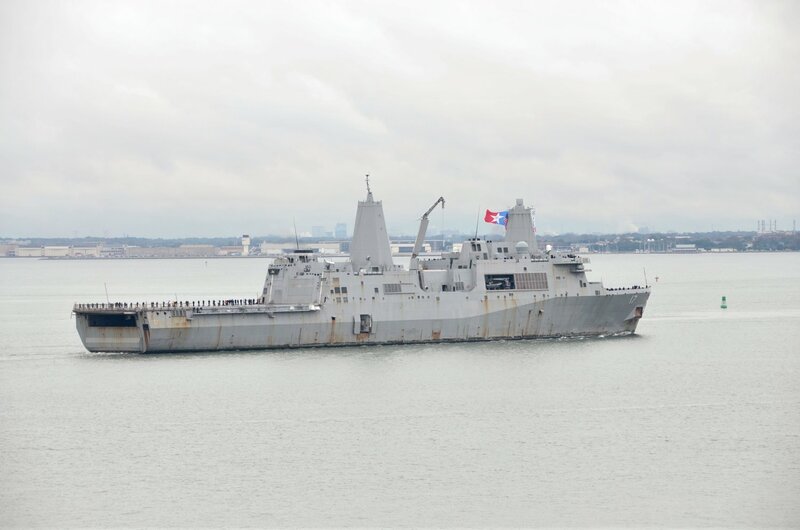 San Antonio is deployed as part of the Iwo Jima Expeditionary Strike Group, which is supporting maritime security operations in the U.S. Navy's 5th and 6th Fleet areas of responsibility. 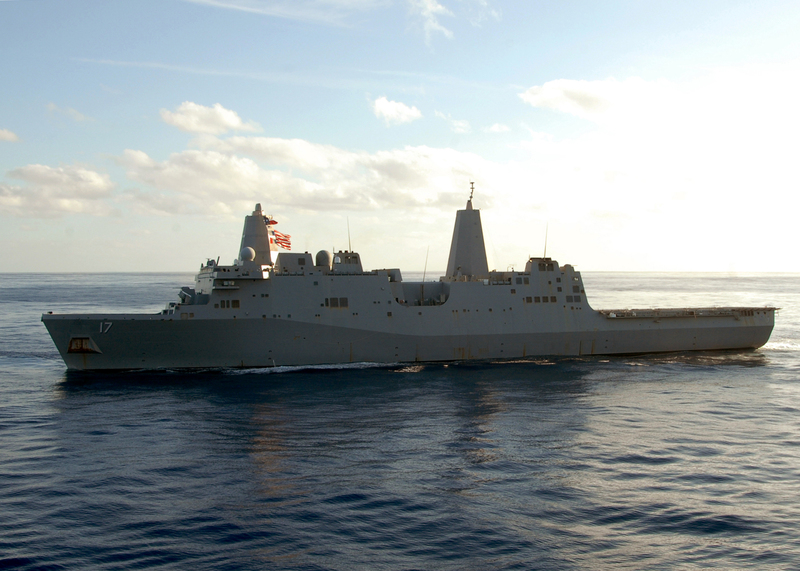 1598k USS San Antonio (LPD-17) transits the Atlantic Ocean, 6 September 2008. 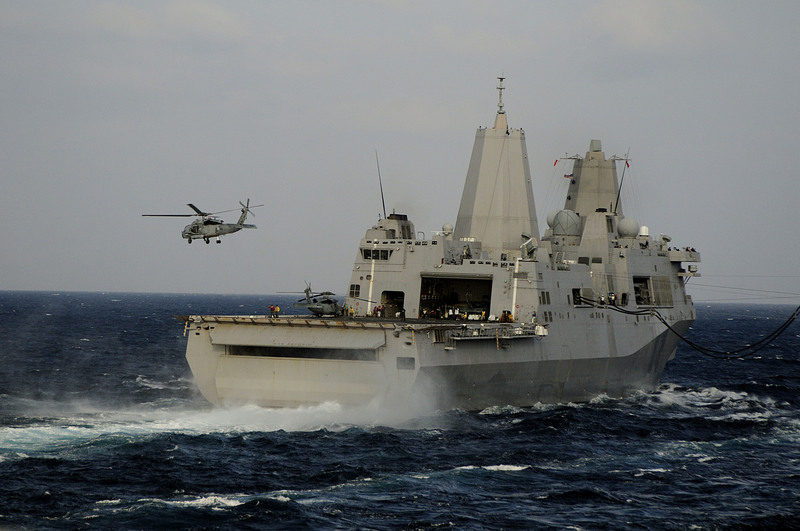 San Antonio is deployed as part of the Iwo Jima Expeditionary Strike Group, which is supporting maritime security operations in the U.S. Navy's 5th and 6th Fleet areas of responsibility. 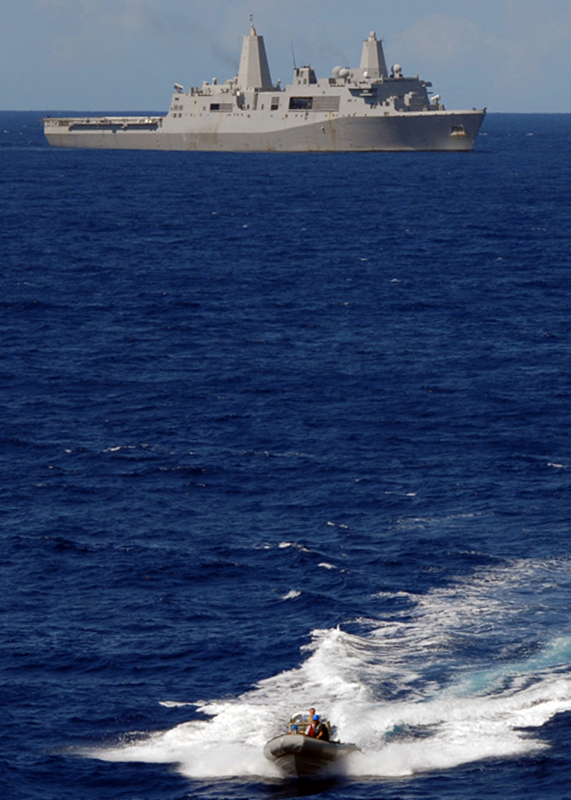 2125k USS San Antonio (LPD-17), the amphibious dock landing ship USS Carter Hall (LSD-50), and the guided-missile destroyer USS Roosevelt (DDG-80) transit the Atlantic Ocean, 6 September3 2008. San Antonio, Carter Hall and Roosevelt are deployed as part of the Iwo Jima Expeditionary Strike Group, which is supporting maritime security operations in the U.S. Navy's 5th and 6th Fleet areas of responsibility. 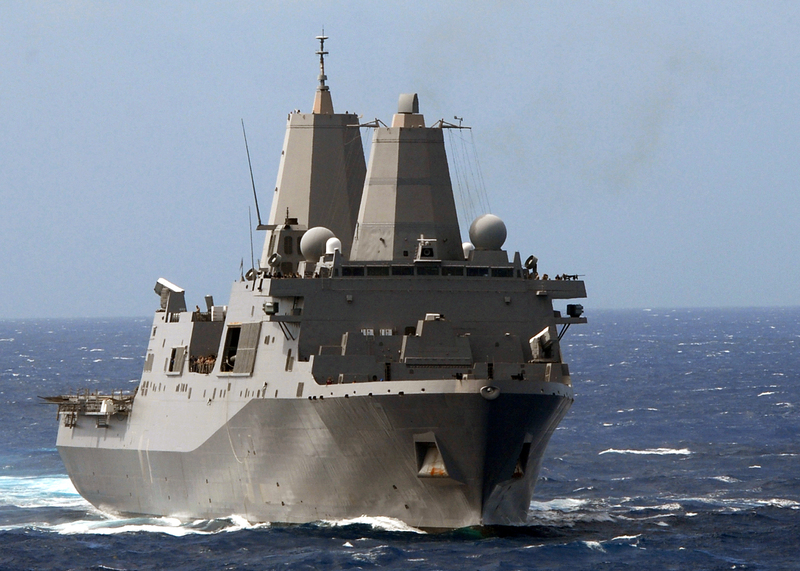 1697k USS San Antonio (LPD-17) steams through the Mediterranean Sea. 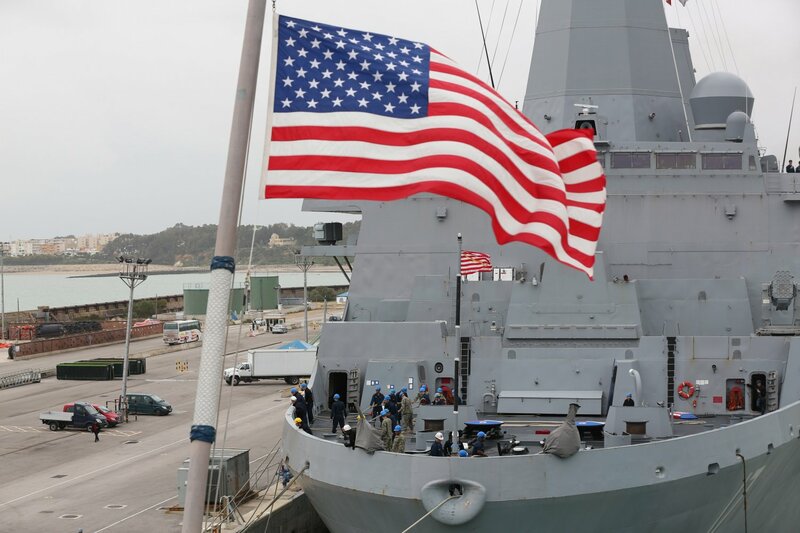 San Antonio is deployed as part of the Iwo Jima Expeditionary Strike Group supporting maritime security operations in the U.S. 5th and 6th Fleet areas of responsibility. 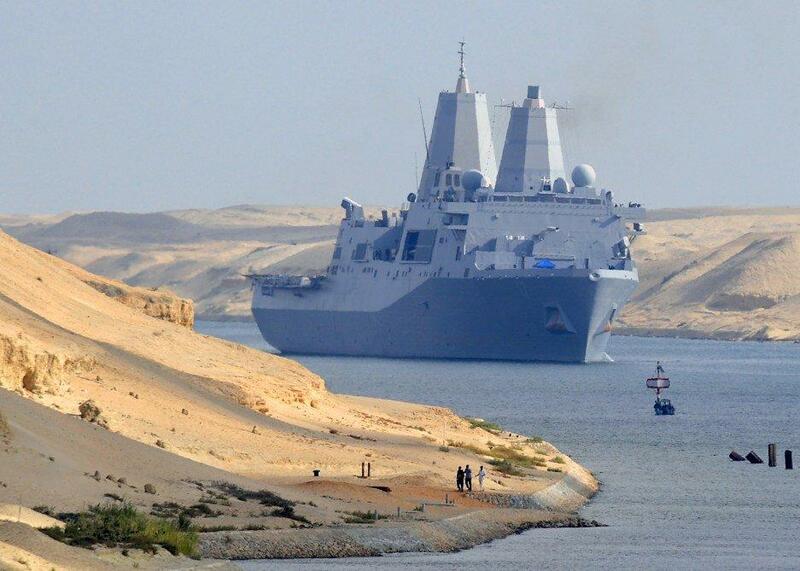 100k USS San Antonio (LPD-17) transits the Suez Canal in 2008. 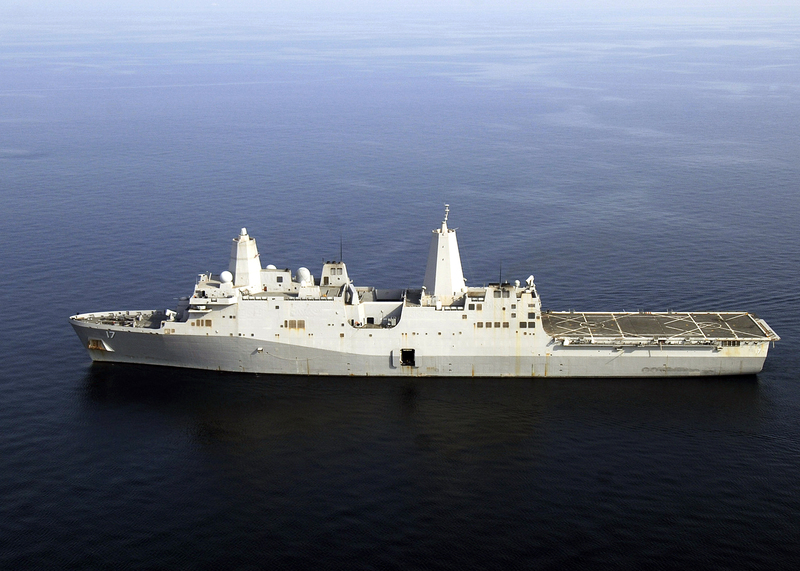 1779k An aerial port view of USS San Antonio (LPD-17) as she transits the Persian Gulf. 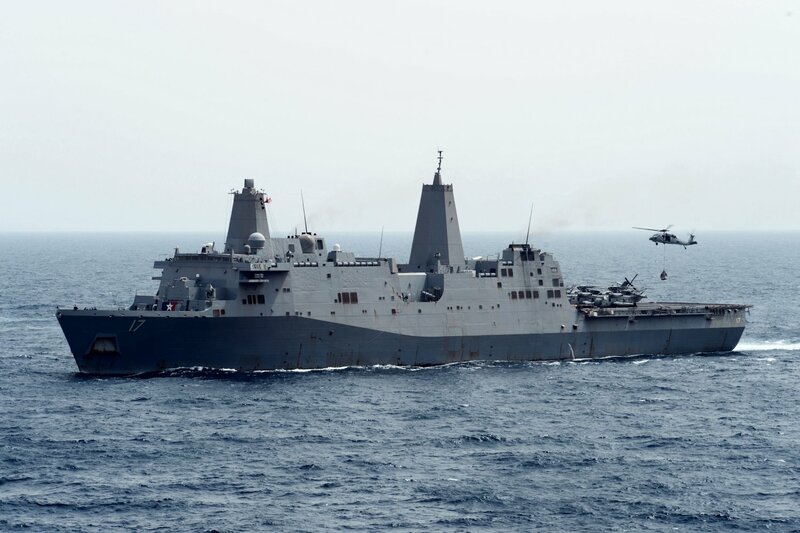 San Antonio is deployed as part of the Iwo Jima Expeditionary Strike Group supporting maritime security operations in the U.S. 5th and 6th Fleet areas of responsibility. 1975k USS San Antonio (LPD-17) conducts an underway replenishment with USNS Laramie (T-AO-203). 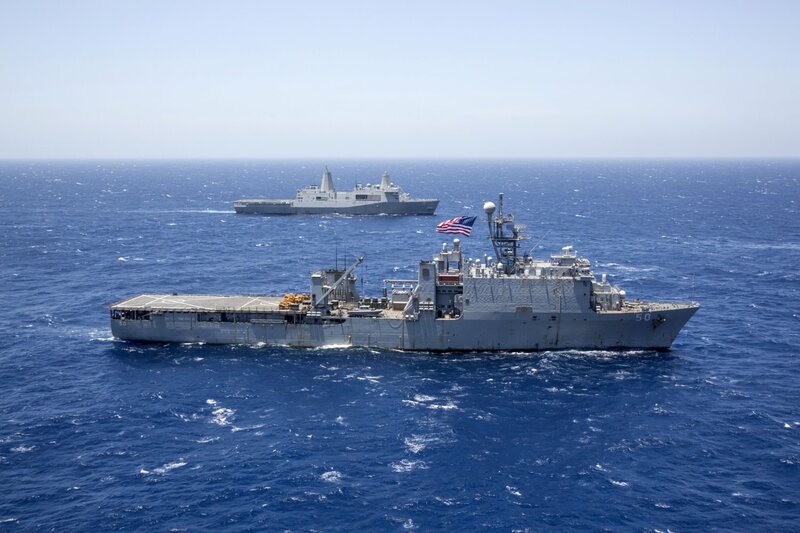 San Antonio is deployed as part of the Iwo Jima Expeditionary Strike Group supporting maritime security operations in the U.S. 5th Fleet area of responsibility..
627k USS San Antonio (LPD-17) conducts an underway replenishment with USNS Lewis & Clark (T-AKE-1). 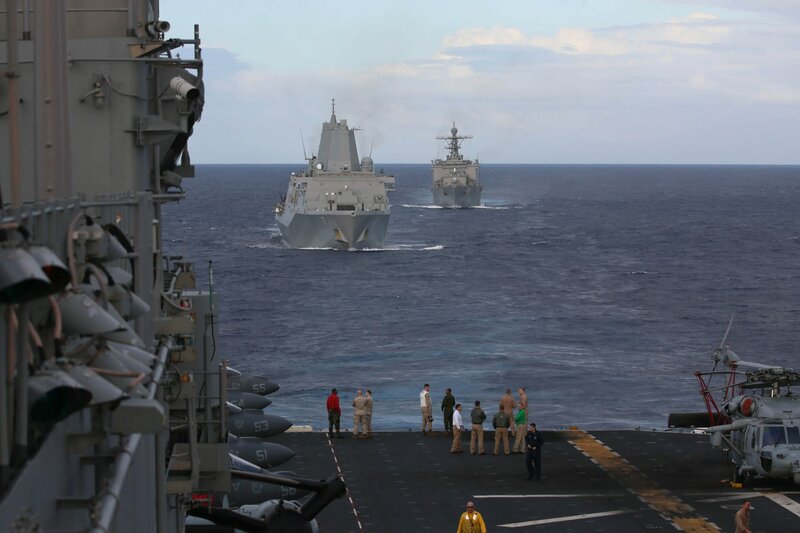 San Antonio is deployed as part of the Iwo Jima Expeditionary Strike Group supporting maritime security operations in the U.S. 5th Fleet area of responsibility. 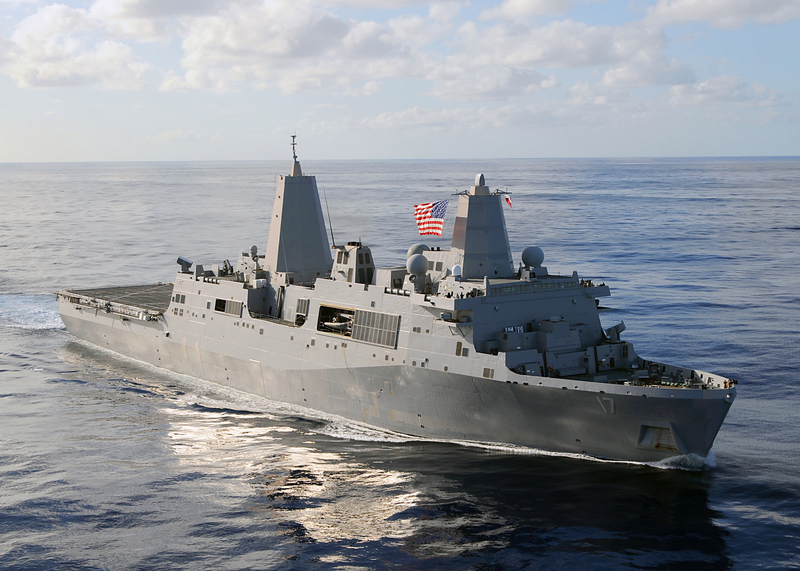 357k USS San Antonio (LPD-17) transits the Gulf of Aden, 12 January 2009. San Antonio is the command ship for Combined Task Force (CTF) 151, which conducts counter-piracy operations in and around the Gulf of Aden, Arabian Sea, Indian Ocean and the Red Sea and was established to create a lawful maritime order and develop security in the maritime environment. 1636k An HH-60H Sea Hawk helicopter assigned to the "Tridents" of Helicopter Anti-submarine Squadron (HS-3) takes off from USS San Antonio (LPD-17) during a vertical replenishment with the Military Sealift Command fleet replenishment oiler USNS Tippecanoe (T-AO 199). 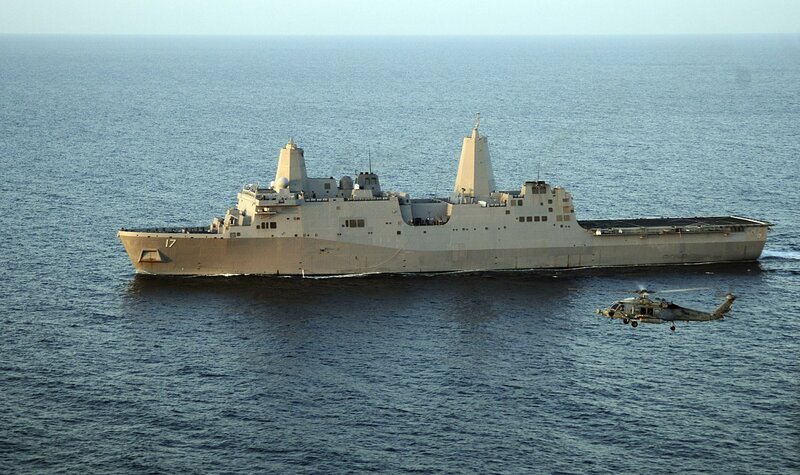 San Antonio is the flagship of Combined Task Force 151, a multinational task force established to conduct counter-piracy operations in and around the Gulf of Aden, Arabian Sea, Indian Ocean and the Red Sea. 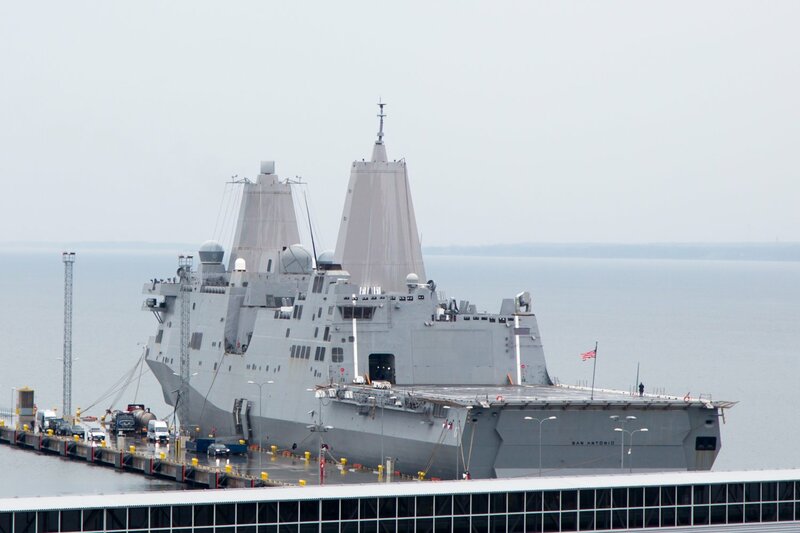 848k USS San Antonio (LPD-17) moored at NavSta Norfolk as her sister ship USS Mesa Verde (LPD-19) gets underway. 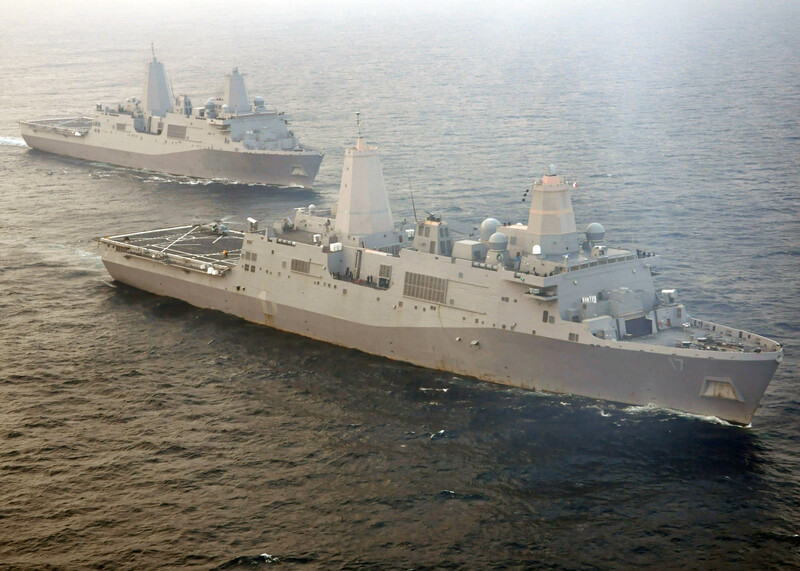 Mesa Verde is part of the Bataan Amphibious Ready Group and was deploying ahead of its original schedule in order to relieve units from the Kearsage Amphibious Ready Group in the Mediterranean Sea..
110609-N-VL218-336 286k USS San Antonio (LPD-17) and USS New York (LPD-21) underway together in the Atlantic Ocean off the coast of Virginia. 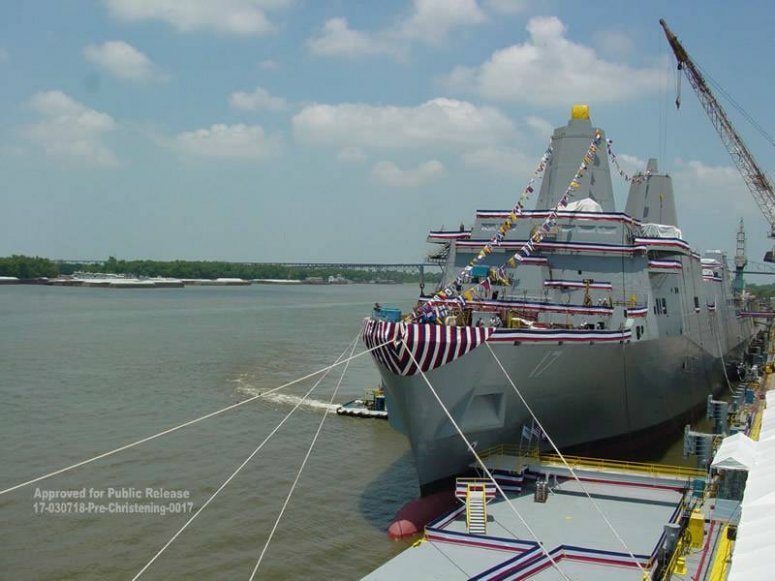 San Antonio is conducting ship handling drills with New York during San Antonio's second phase of sea trials, which are primarily focused on combat systems testing and developing crew proficiency. 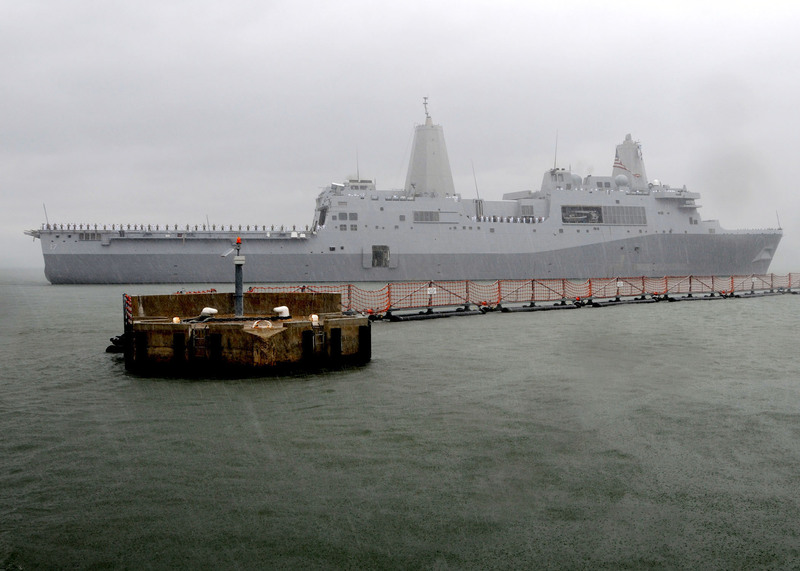 311k USS San Antonio (LPD-17) returns to Naval Station Norfolk after completing the second phase of a two-part series of sea trails. 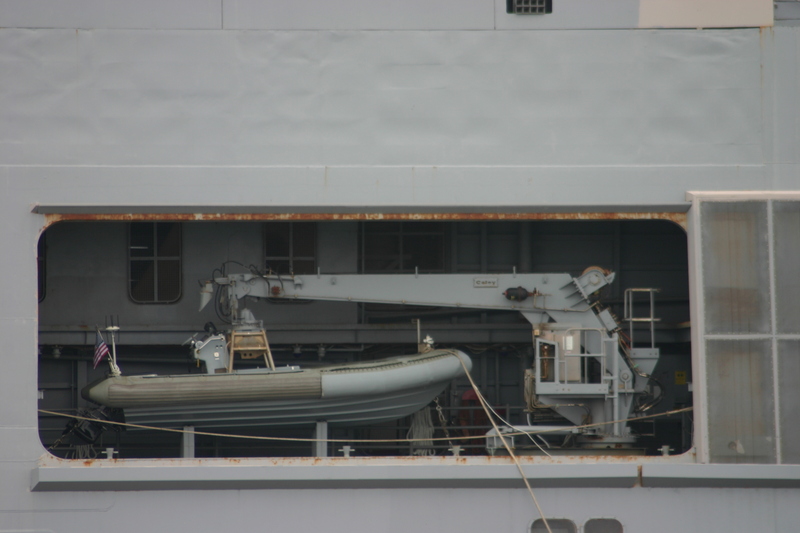 The sea trials evaluated shipboard systems and developed crew proficiency. 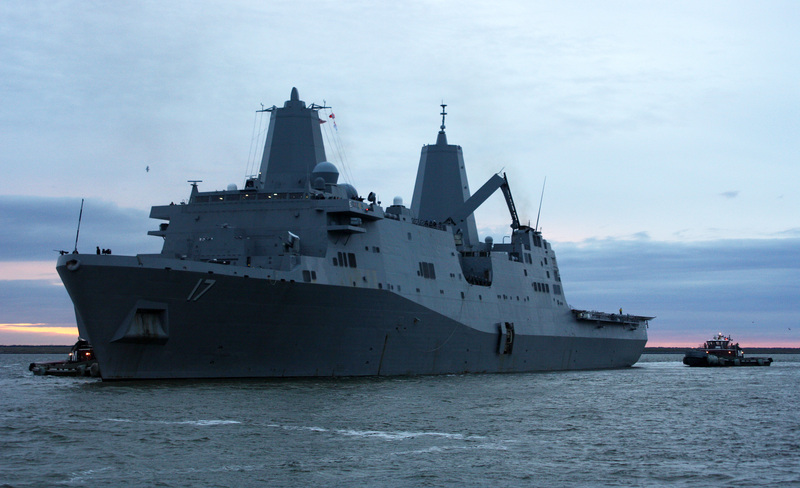 1416k USS San Antonio (LPD-17) departs Naval Station Norfolk. 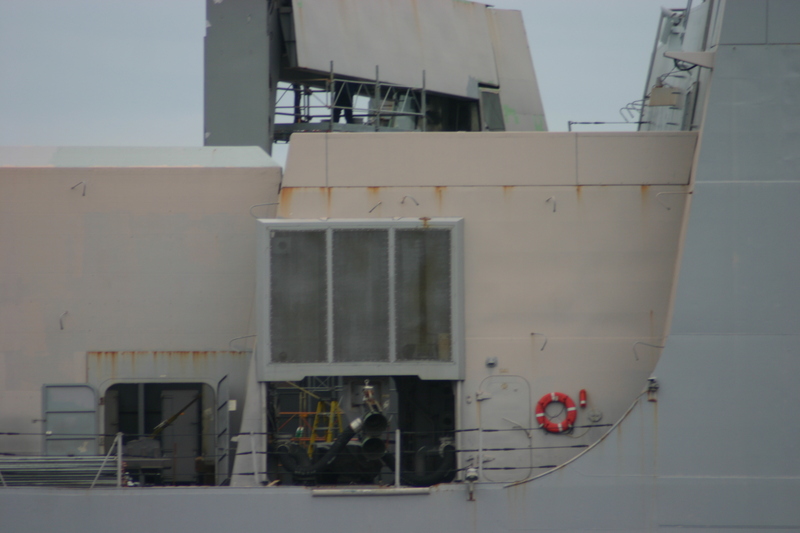 San Antonio was getting underway to better position Navy assets if required to provide Navy relief to areas affected by Hurricane Sandy. 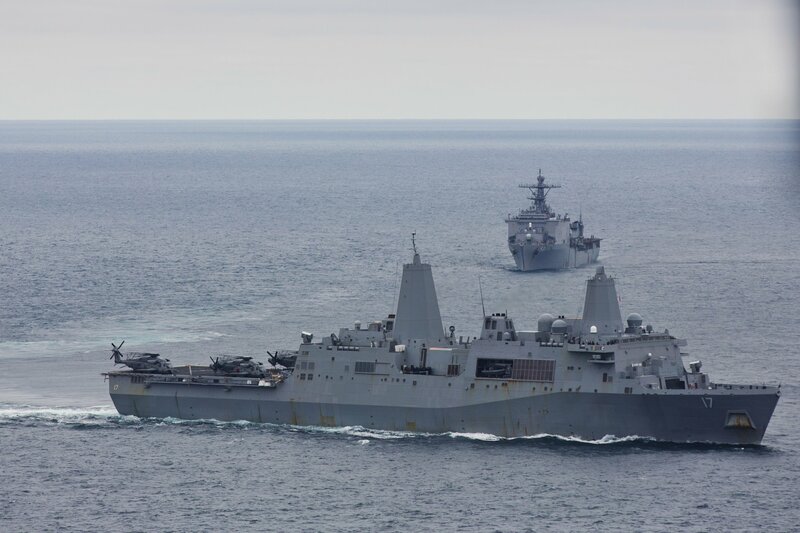 606k USS San Antonio (LPD-17) and the amphibious dock landing ship USS Carter Hall (LSD-50) sail in formation during a simulated strait transit. San Antonio and Carter Hall are participating in Composite Training Unit Exercise (COMPTUEX) off the East Coast of the U.S. in preparation for a deployment this spring. 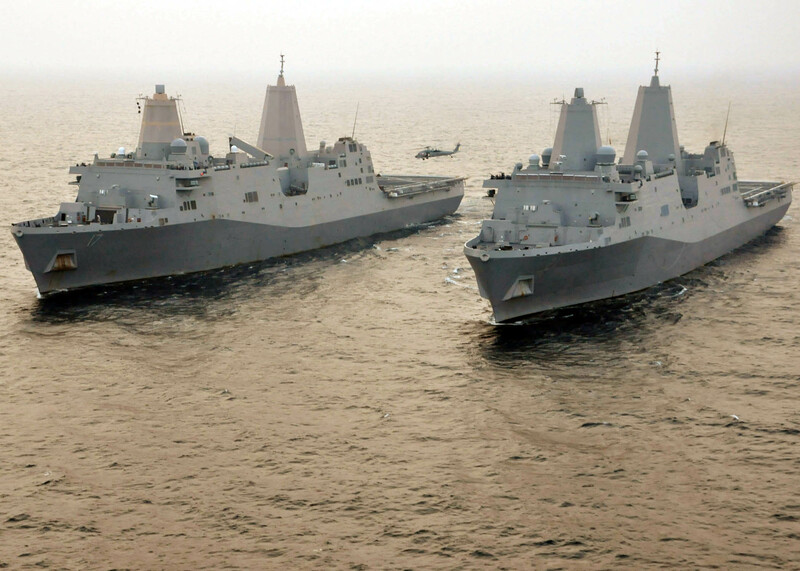 130321-N-SB587-349 179k USS San Antonio (LPD-17) and the amphibious dock landing ship USS Carter Hall (LSD-50) sail in formation with the amphibious assault ship USS Kearsarge (LHD-3). Kearsarge, Carter Hall and San Antonio are deployed as part of the Kearsarge Amphibious Ready Group with embarked Marines from the 26th Marine Expeditionary Unit (26th MEU) supporting maritime security operations and theater security cooperation efforts in the U.S. 5th and 6th Fleet areas of responsibility. 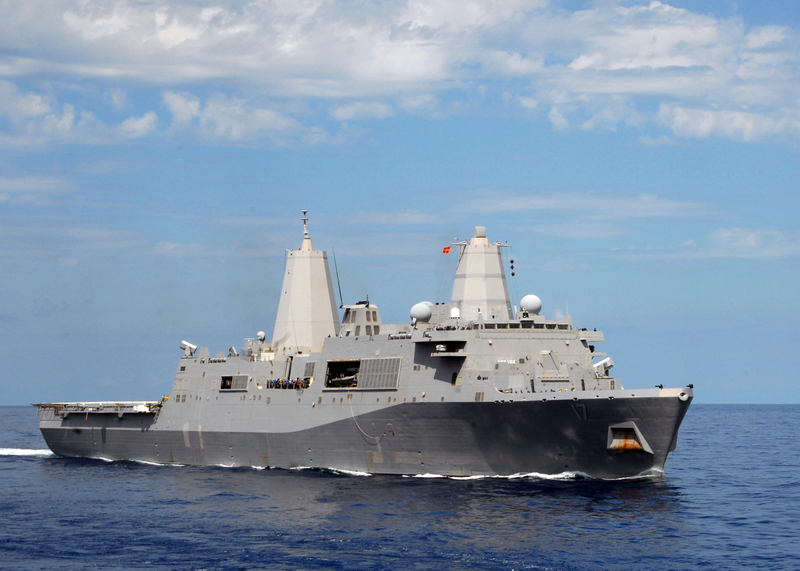 218k USS San Antonio (LPD-17) moors in Rota, Spain. San Antonio is deployed as part of the Kearsarge Amphibious Ready Group with embarked Marines from the 26th Marine Expeditionary Unit (26th MEU) and is on a scheduled deployment in support of maritime security operations and theater security cooperation efforts in the 6th Fleet area of responsibility. 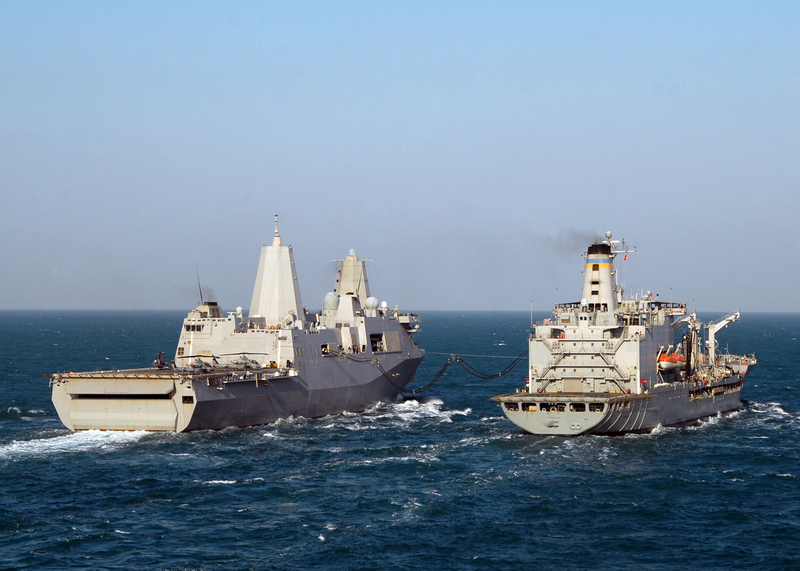 314k The Afloat Forward Staging Base (Interim) USS Ponce (AFSB(I)15), bottom, transits the Arabian Gulf with USS San Antonio (LPD-17). 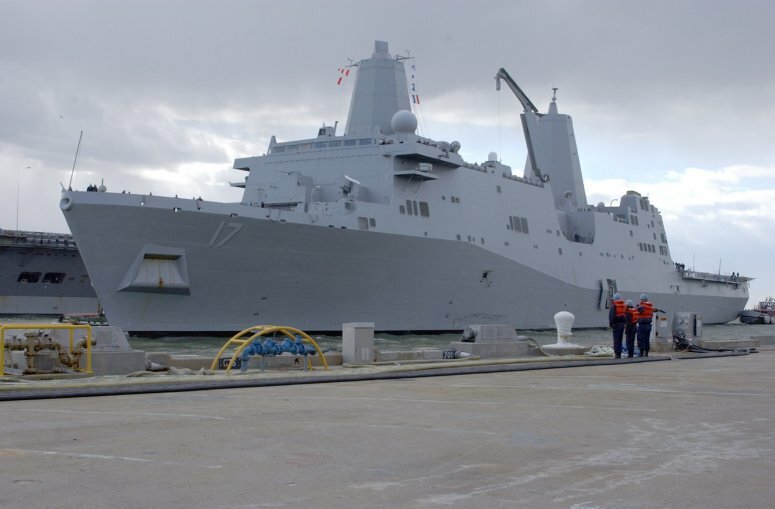 San Antonio is deployed as part of the Kearsarge Amphibious Ready Group and, with the embarked 26th Marine Expeditionary Unit (26th MEU), is deployed in support of maritime security operations and theater security cooperation efforts in the U.S. 5th Fleet area of responsibility. 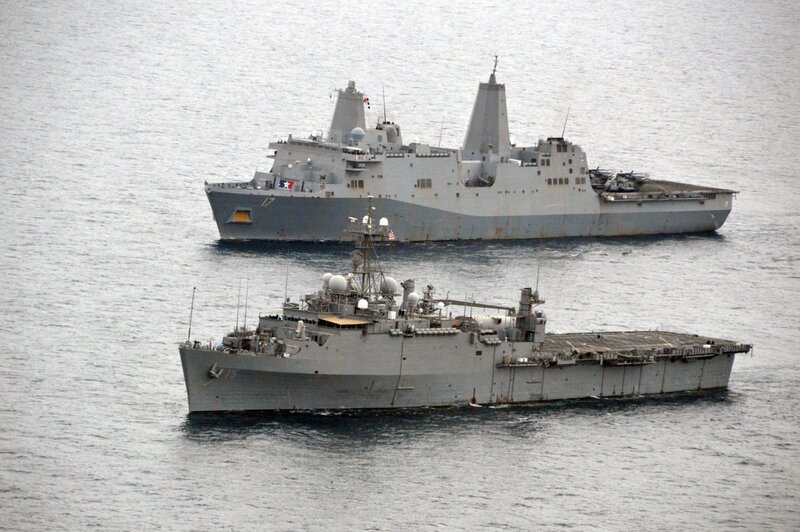 254k The dock landing ship USS Carter Hall (LSD-50) foreground, and USS San Antonio (LPD-17), both part of the Kearsarge Amphibious Ready group, are underway in formation. 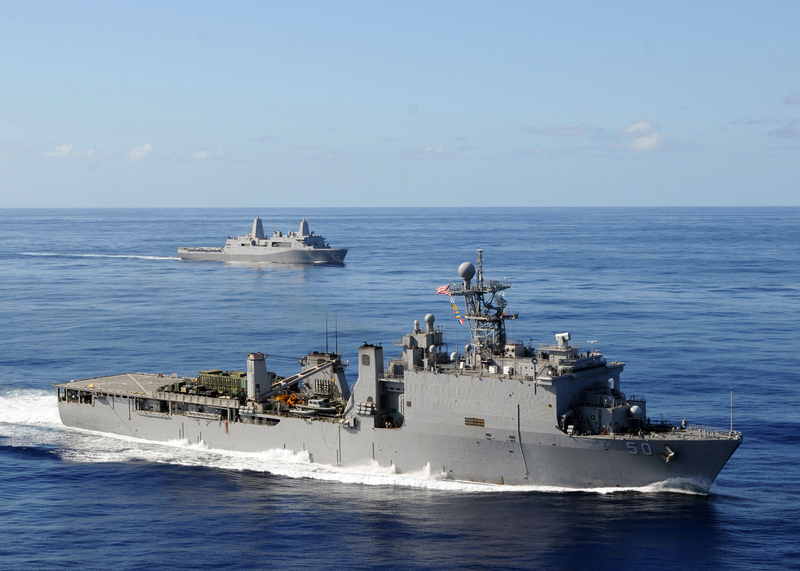 The group is deployed in support of maritime security operations and theater security cooperation efforts in the U.S. 5th Fleet area of responsibility. 243k An MH-60S Sea Hawk helicopter hauls cargo from USS San Antonio (LPD-17) during a replenishment-at-sea. 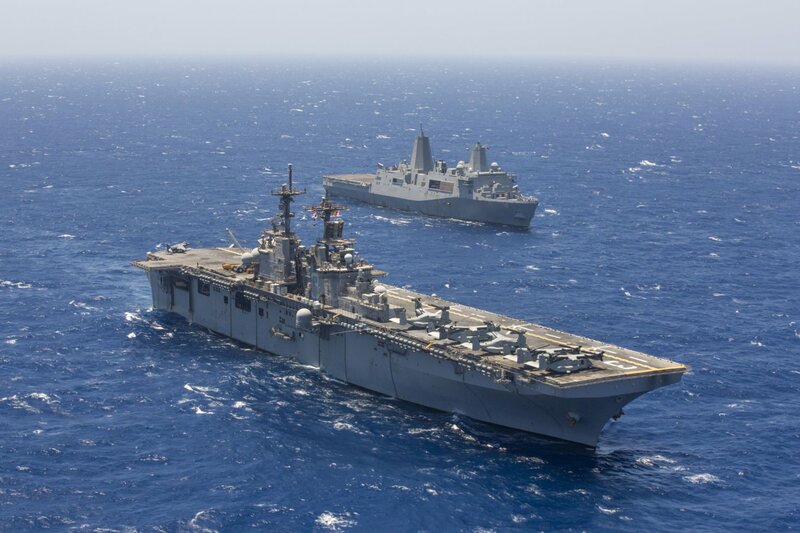 San Antonio is part of the Kearsarge Amphibious Ready Group and, with the embarked 26th Marine Expeditionary Unit (26th MEU), is deployed in support of maritime security operations and theater security cooperation efforts in the U.S. 5th Fleet area of responsibility. 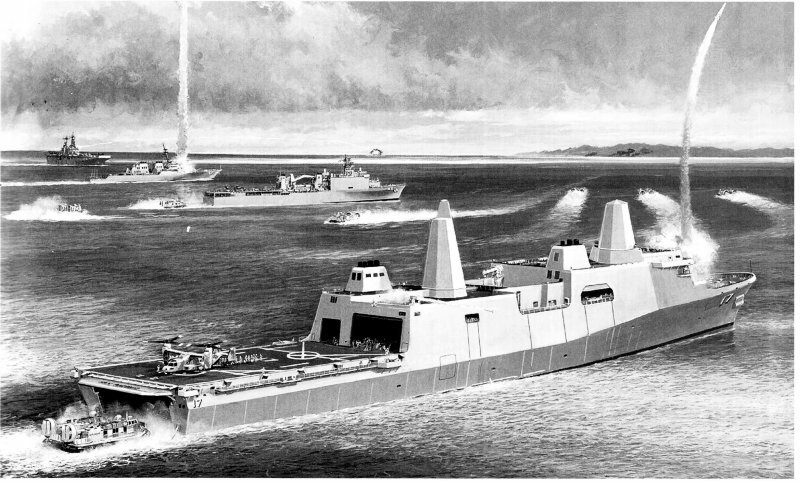 104k USS San Antonio (LPD-17) underway off Naval Station Norfolk, VA., date unknown. Richard Miller BMCS USNR Ret. 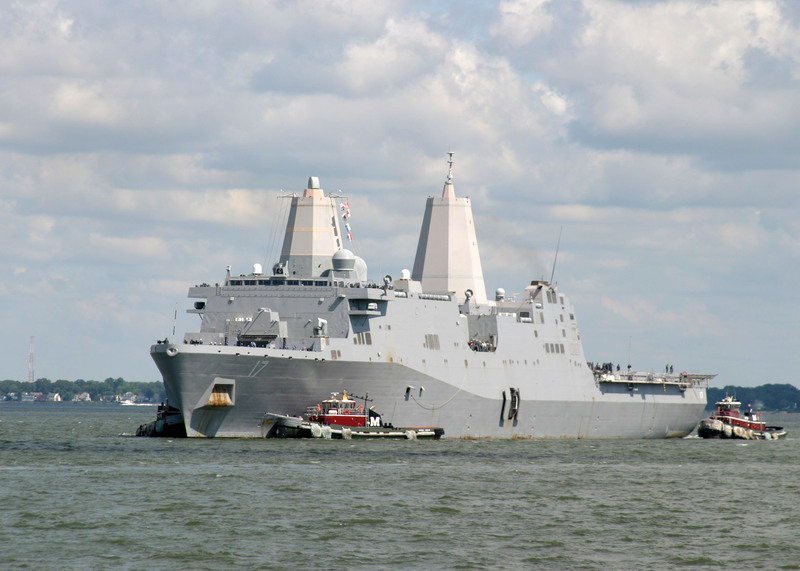 1560k USS San Antonio (LPD-17) enters New York harbor during the Parade of Ships to start Fleet Week New York 2015. 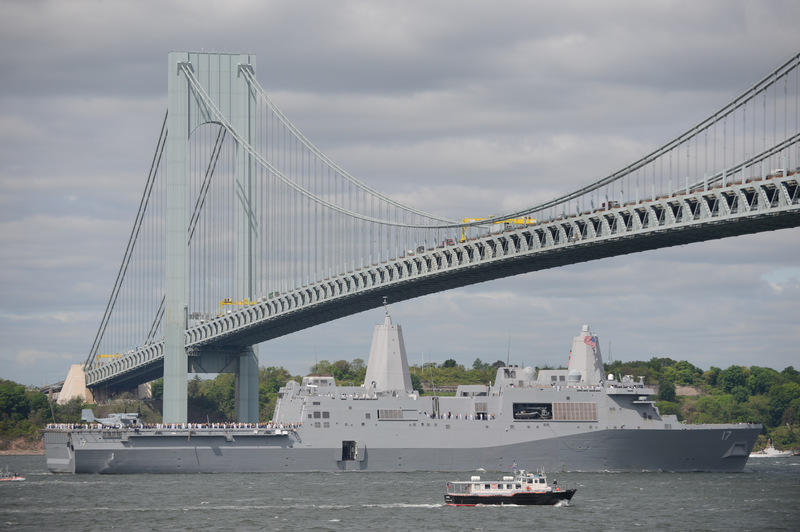 Fleet Week New York, now in its 27th year, is the city's time-honored celebration of the sea services. 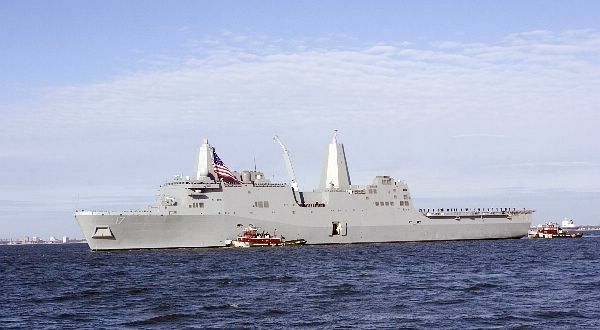 It is an unparalleled opportunity for the citizens of New York and the surrounding tri-state area to meet Sailors, Marines and Coast Guardsmen, as well as witness first hand the latest capabilities of today's maritime services. 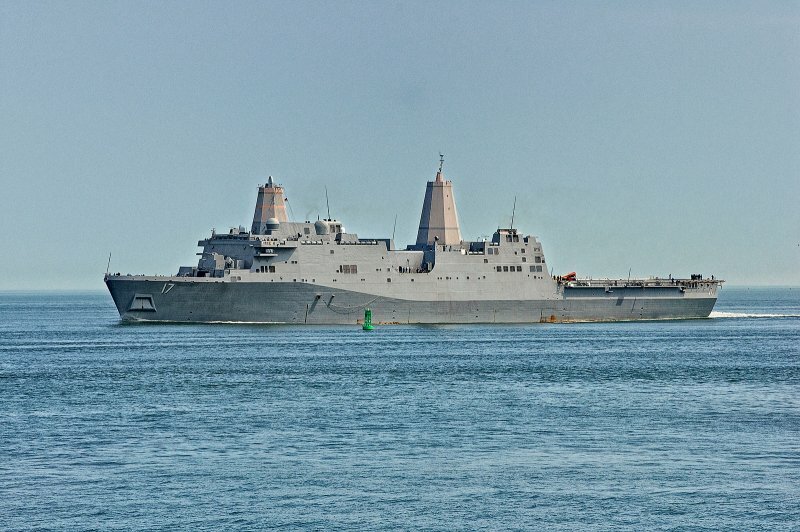 68k USS San Antonio (LPD-17) enters New York harbor during the Parade of Ships to start Fleet Week New York 2015. 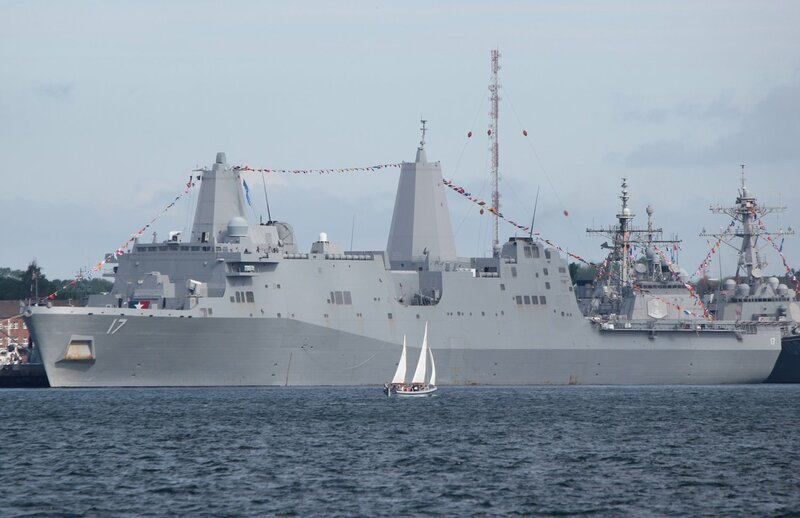 Fleet Week New York,May 20, 2015. 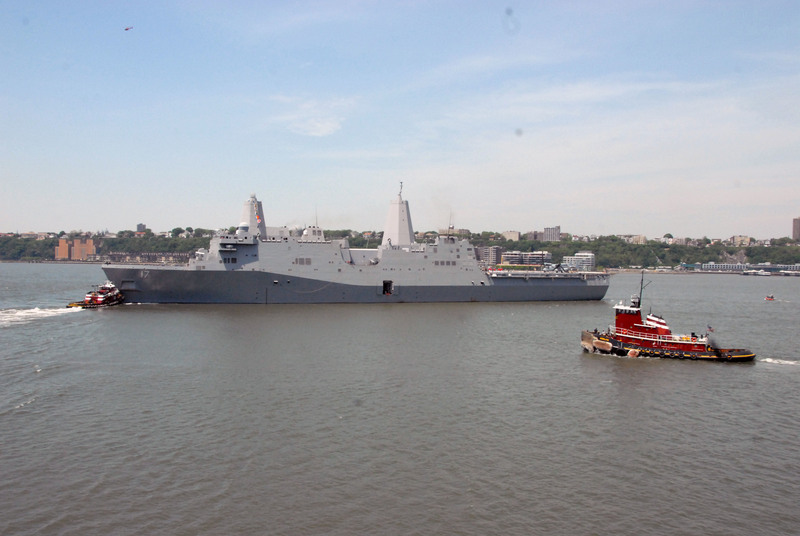 850k USS San Antonio (LPD-17) departs Pier 92 in Manhattan as Fleet Week New York 2015 comes to an end. 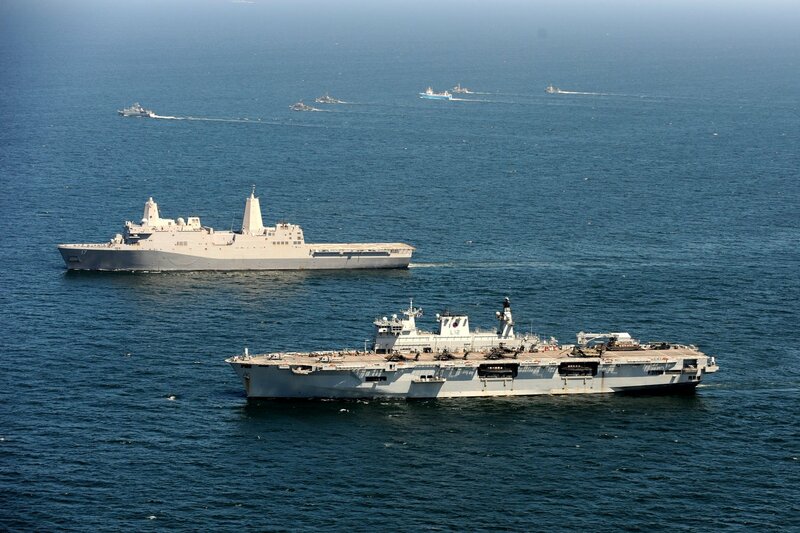 382k USS San Antonio (LPD-17) steams in company with HMS Ocean (L-12) during BALTOPS 2015. 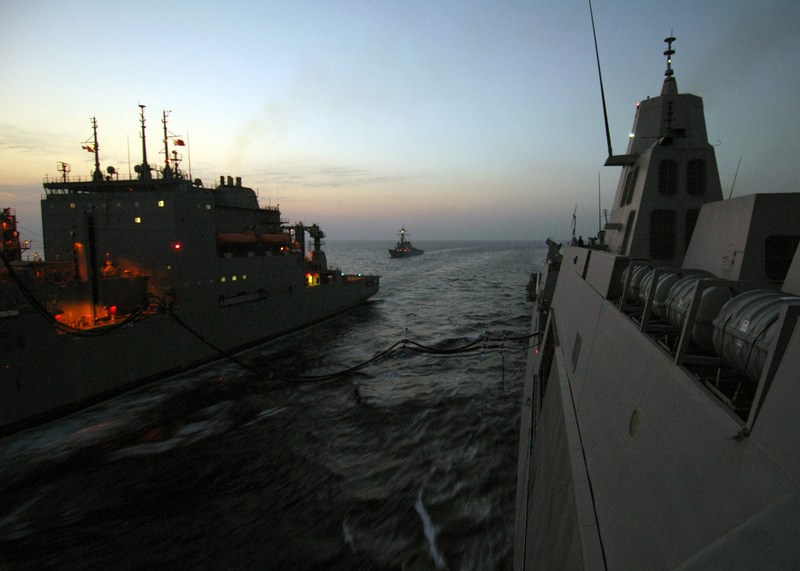 Maritime forces from 17 nations are underway in formation for BALTOPS 2015. BALTOPS is an annually recurring multinational exercise designed to enhance flexibility and interoperability, as well as demonstrate resolve of allied and partner forces to defend the Baltic region. 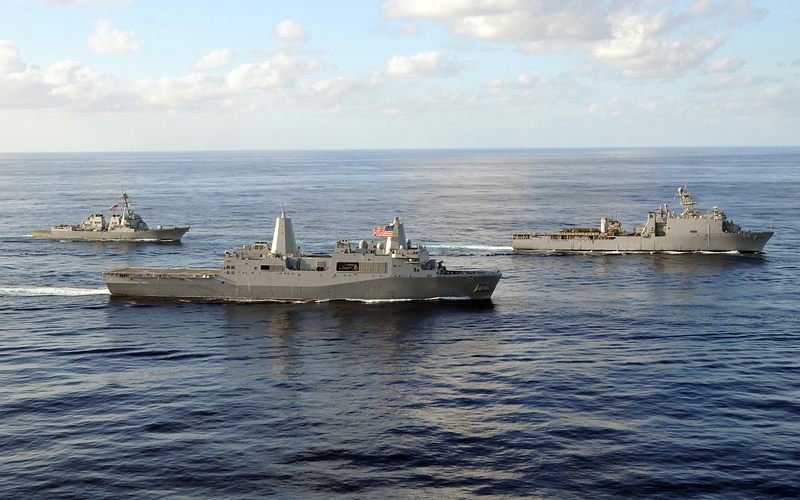 150612-N-HX127-135 BALTIC SEA (June 12, 2015) 1127k USS San Antonio (LPD-17) transits in formation off the coast of Sweden while participating in BALTOPS 2015. 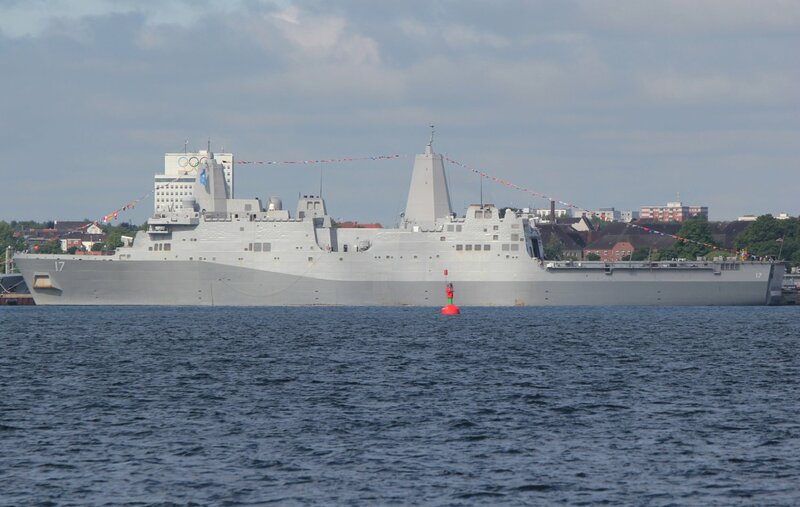 149k USS San Antonio (LPD-17) moored pierside at Tallinn, Estonia, 23 June 2015.